The studio is still at work on their next game, according to Criterion producer Matt Webster. After the surprise announcement last week of Criterion founders Alex Ward and Fiona Sperry leaving the studio, questions began looming about the future of the Burnout and Need for Speed developer. According to Criterion producer Matt Webster, though, things are moving forward as normal. "It's business as usual for us here at Criterion and we continue cooking up something new, continuing from our work last year," he wrote to The Escapist via email. "When the time is right we'll make time to talk about Criterion, the future and our new game," he said. 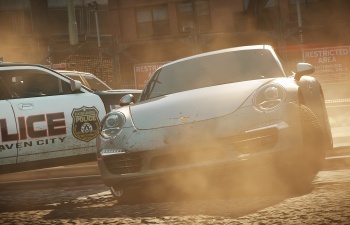 The developer had most recently released 2012's Need for Speed: Most Wanted. Parent company Electronic Arts has stated that Webster is currently leading development on a new Criterion project for next generation consoles. "Matt has been part of Criterion for years and has an exciting vision for this new game," wrote an EA spokesperson in an email to The Escapist earlier this week. Webster told The Escapist to expect additional comments from Electronic Arts regarding Criterion at a later date. We'll keep you posted when we hear anything. On Twitter, Ward explained that he and Sperry left Criterion so they could form their own studio. At the time of their departure, their LinkedIn profiles stated that the two were working on an "Undisclosed 'Team Zero' Project" at Criterion.